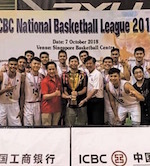 The Singapore men's basketball team thrashed Laos 103-51 to win their second SEA Games Group B match at Stadium MABA in Kuala Lumpur yesterday. As the scoreline suggested, it was one-way traffic for the Singaporeans right from the tip-off. By the end of the first quarter, Wei Long Wong (187-G-88) and Co. had built up a 13-point lead, and the advantage widened to 20 points at half-time. Singapore then stepped on the accelerator in the third period to double the lead to a whopping 40 points. Singapore's top-scorer Leon Kwek sealed the emphatic win with a lay-up to take his tally to 18 points. Debutant Lavin Raj, who has reportedly drawn interest from colleges in the Philippines, also shone. The 2m-tall centre, who is 17, bagged 17 points. In their opening game, Singapore beat Cambodia 95 -64.